Tokushima Awaodori (徳島阿波踊り) is the best Awaodori Dance Parade in Japan. Awaodori was began in 1587 for celebration of building Tokushima Castle. There are over 1,000 dance teams perform at Tokushima Awaodori. So,about 10,000 dancers dance like crazy during the festival. Tokushima Awaodori is the most exciting and powerful summer festival in Japan. Also, about 1.3 million people enjoy this festival. The team consists with male dancers, female dancers and music players. All team has different style of dance, costume and music. The streets become the stage for their performance. Period: August 12 to 15. Around Tokushima Station all the streets will be closed. There are two kinds of stage. Paid stages and free stages. You can get a map of the stage at the station. Tokushima is the birthplace of Awaodori. The history of Awaodori began when the lord of Tokushima built Tokushima castle in 1587. 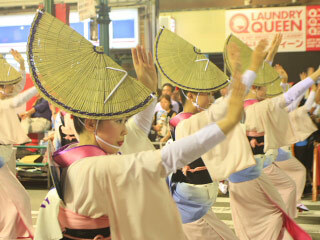 For the celebration of theTokushima castle, people of Tokushima danced Awaodori. This is the beginning of Awaodori. There are about 1,000 dance team join Awaodori parade. The team is called "Ren." Each Ren has male dancers (Women also join), female dancers and music players. The music players have Drums, Lutes, Bells and flutes. Each Ren has unique costumes, music and dance performance. There is Ren called "Niwaka Ren" that all the visitors can join. So, this is the main attraction of Tokushima Awaodori. Unlike other dance festival, all people can join the dance parade.